Easy dal is a healthy side dish for roti within 20 minutes. This healthy dal includes moong dal, a few vegetables, mashed garlic cloves and lots of cumin. It's a comfortable dish for your dinner with roti. This dal is healthier than store bought ready mix packs and easier too. When the dals are cooking, you can roll and toast the rotis and you can finish your dinner cooking within 30 minutes. Sometimes for dinner the simplest things work the best. This dal is such a satisfying healthy side dish for roti. In this dal, I have added few carrot slices and beans. Carrots and beans are the perfect vegetables for this dal because it gets cooked easily along with the moong dal. There is no need to soak the dals and no other grinding works for this dal. Now let's see how to prepare this Easy dal with step by step instructions. 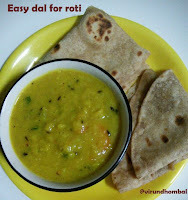 Easy dal is a healthy side dish for roti within 20 minutes. 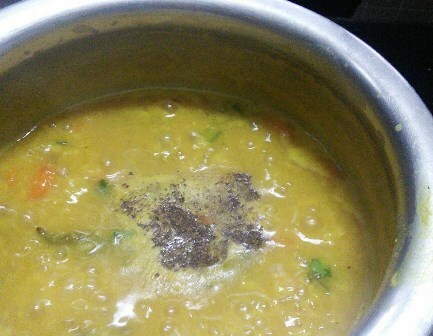 This healthy dal includes moong dal, few vegetables, mashed garlic cloves and lots of cumins. Wash the moong dals and add it to a small pressure cooker or pan. Next, add the carrots, beans and slit green chillies. 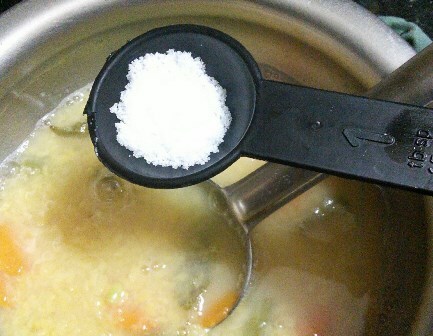 Pour 1 cup water, mix them well and pressure cook for 3 to 6 whistles. Transfer the cooked dal to a vessel. Add required salt. 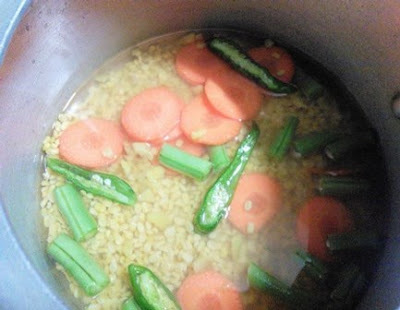 If the dal appears thick, add some more water. 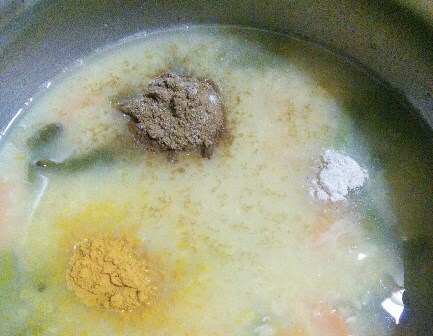 Next, add the cumin powder, asafoetida powder and turmeric powder. Mix them well. Now keep the dal on low heat and allow the dal to boil. 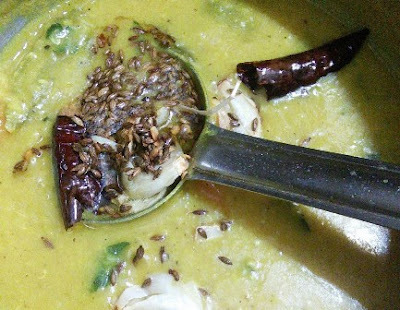 When the dal starts to boil well for 5 to 7 minutes, add the black pepper powder, curry leaves and coriander leaves. After a few seconds, turn off the heat and add the lemon juice. Mix them well. Heat ghee in a small frying pan and add the cumins, crushed garlic cloves and broken red chillies. When you get a nice aroma form the garlic cloves add it to the hot dal. Mix them well and serve it hot with sliced cucumbers. 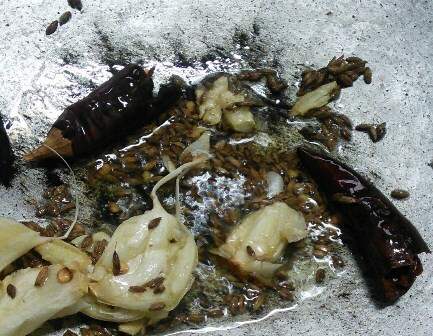 Wash the moong dals and add it to a small pressure coooker or pan. Next, add the carrots, beans and slit green chillies. Pour 1 cup water, mix them well and pressure cook for 3 to 6 whistles. 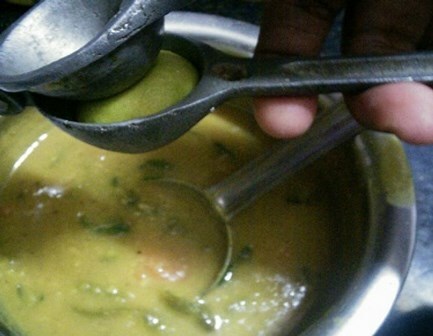 Transfer the cooked dal to a vessel. Add required salt. If the dal appears thick add some more water. Now keep the dal on low heat and allow the dal to boil. When the dal starts to boil well for 5 to 7 minutes, add the black pepper powder and coriander leaves. Heat ghee in a small frying pan and add the cumins, crushed garlic cloves and broken red chillies. When you get a nice aroma form the garlic cloves add it to the hot dal. Mix them well and serve it hot with sliced cucumbers. If you try this recipe for Easy dal send us your comments below and share the recipe for your friends and family.